With Blue Monday behind us it was time to dust off the bobby socks and a wop bop a lula a wop bam boo down to the King's Theatre. Certainly the merchandise seller at the theatre had not been hit by the January blues, decked out in Rydell High branded clothing and loudly selling “dead good” programmes. Now, here’s my confession: in all my years of theatre going I have never seen a professional production of Grease before – I know, I know, I don’t know how it happened either but I have now. 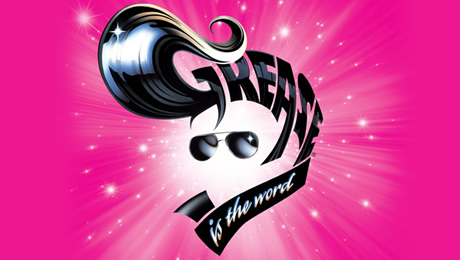 The key difference between Grease and more recent musicals that are also films, is that for anyone looking to buy tickets thinking this is another film to stage musical it’s worth remembering that the stage musical came first in this case and therefore it’s not the same. Yes, all the core elements are there but not necessarily in the order that film-lovers will be used to. That said, it’s certainly refreshing to take another look at Danny, Sandy and the gang. As the house lights dimmed, and the iconic logo temporarily blinded the audience, the band started playing the unmistakable notes of the show’s biggest hits in a medley and immediately a ripple of expectation went through the auditorium as the traditional "seat dancing" began. I have to hand it to the ladies in the row behind me, theatre seats are notoriously difficult to bust a move in but these ladies, as we say in these parts, were giving it laldy. Backstage Pass's Amy Walker saw this tour in Birmingham last year and it's clear to see why this show has such enduring appeal at the box office. For the most part the staging is simple and effective with a few notable mentions: the bleachers, the diner and of course the giant beast that is Greased Lightning. Led by Danny Bayne and Carina Gillespie, the energetic cast shimmy and shake their way through Arlene Phillips’ choreography seemingly effortlessly. ‘We Go Together’ is particularly eye catching and it’s a credit to the talented cast that not a single finger was out of place in the complicated choreography and they made it look easy. Danny Bayne brings some of John Travolta’s characterisation to his portrayal of Danny while still making the part his own. Certainly his strong dance background shines through particularly in ‘Born to Hand Jive’. Carina Gillespie captures the innocent essence of Sandy beautifully making her transformation at the finale even more incredible. Bayne and Gillespie have great chemistry together but the character parts felt as if they had less depth than the film which is a reflection on the writing rather than their acting. Kate Somerset brings out Rizzo’s mean streak to great effect then completely disarms the audience with a heart-wrenching, vulnerable performance of ‘There are worse things I could do’. Darren John is scene-stealing in his Lee Evans-style performance of Eugene and Laura Wilson (Jan) has an uncanny resemblance to Didi Conn, Frenchy in Grease the film. Unfortunately in some of the ensemble pieces, leading vocals were drowned out by the music which was disappointing in Summer Nights but for the most part wasn’t an issue in numbers where hand-held microphones were used. It was frustrating for the classic songs where the individual lyric lines are important to have them lost in a wall of sound. I also found the use of strobe lighting difficult. There are prominent warnings of this around the theatre but it’s worth bearing in mind if this is an issue for you as it was unavoidable. As musicals go there are few as classic or with such popular appeal as Grease which is why I have no doubt that tickets will be harder to come by than Rizzo saying no to a guy. Make sure you don’t miss out the chance to join the Pink Ladies and T Birds and chase those January blues away at the King’s Theatre where Grease is the word until 28th January.